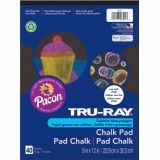 Premium sulphite heavyweight jet black construction paper accepts and provides great contrast with both white and colored chalk and chalk markers. Colors POP on this black paper! Acid free for less fade. 9" x 12". 40 sheets.